Numerous pests make their way inside of our homes every year. Cockroaches, crickets, ants, and an assortment of additional pests are a nuisance, but not as harmful to the structure of your home as termites. Termites threaten the integrity of the structure in the very home you’ve worked so hard to own and the damage is often not covered by homeowners insurance. Causing more damage than hurricanes, tornadoes, windstorms, and fires put together, termites might appear small and harmless but pose many threats to a home. It is important to learn how to prevent termites and what to do if you have an infestation. As detritivores, termites feed on dead plant matter, with many of the species preferring a cellulose meal devoured from dead wood alongside your home. Termites are found all over the world with the exception of Antarctica, although they do prefer warmer versus cold temperatures. More than 3,400 species of the insect exists, and 50 of those have been identified in the United States. These species are categorized into one of three subcategories: dampwood, drywood, and subterranean. The type of termite you’ll notice varies according to your residence. Dampwood termites are found across the United States and are larger in size than drywood or subterranean termites. Several types of dampwood termites exist, each preferring damp or decaying timber that is close to the ground. 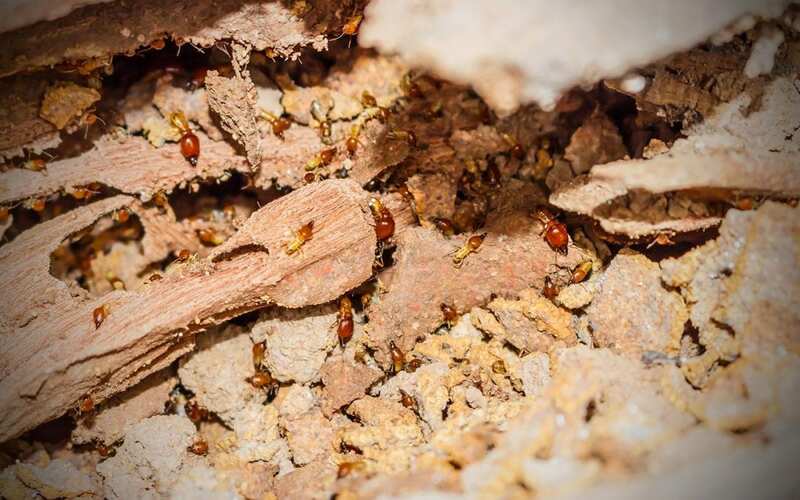 This termite species damages a home by feasting on moist wood caused by plumbing leaks, poor ventilation, or water intrusion and causes considerable damage that costs thousands of dollars to repair. Drywood termites do not have contact with the ground. They live in colonies inside of wood and cellulose inside of the wood. Drywood termites can survive without moisture and cause massive amounts of damage very quickly. This termite species is most commonly found in the south and the southwest U.S.
Subterranean termites live in the soil underneath the home where they typically cause damage to the home by forming mud tubes or through hollow openings in the wood. Foundation and concrete cracks also provide easy entry for this termite. To best prevent subterranean termites, make sure you keep your gutters and downspouts clear and effectively diverting water away from the foundation of your home. Attics and crawlspaces should be properly ventilated and may require the use of a dehumidifier. Subterranean termites are one of the fastest growing termites species and are also the most destructive. Termite infestations cost homeowners many thousands of dollars in repair costs every year. Sometimes termites can go undetected for years, further increasing the damage that is left behind. Considering the small colonies of termites can contain as many as 500,000 individual insects, eating up to 16 grams of food per day, it is easy to understand how quickly these insects can cause considerable damage. Being of the inconsiderate type, termites don’t choose one source from which to consume their nearly 12.9 pounds of annual food. Instead, they rely upon several wood sources from which to dine, further damaging your home and it’s structure. Eliminating termites isn’t easy, so it’s beneficial to learn how to prevent termites and avoid the problem altogether. It is much easier to prevent termites than treat them. In either situation, however, make sure that you hire a qualified termite pest control expert to aid in detecting and diagnosing any termite infestation you may have. InspectorUSA provides home inspection services including termite and pest inspections to Central Kentucky and also provides a full menu of other pest control services. Contact us to address all your pest control needs.